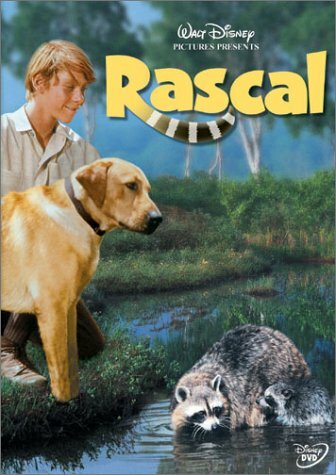 “Rascal” is the true story of a baby raccoon which author Sterling North found when he was 11 years old, and raised until it was time to set the raccoon back in the wild. This is a sweet story, and the bits which may cause some parents concern in the book itself are not even present in the movie, making it sweeter still. There are spoken threats to the raccoon (neighbors warn that if the raccoon starts to raid gardens, he will be shot), but it never goes beyond that. That said, there are scenes where Sterling’s father has a dead turkey slung over his shoulder, and another where the plucked turkey is ready to become dinner. Also, in one scene Sterling’s father invites the town’s new minister and Sterling’s teacher in to dinner, and proceeds to get them drunk on hard cider. One other matter which may cause concern for some – although it is based on reality – is that Sterling’s mother has passed away, and, to compound matters, his father is a travelling entrepreneur, and he often leaves young Sterling at home alone for days on end (it is made clear in the movie that this is not ok, although Sterling’s father doesn’t seem to see it that way at first). Finally, there is a scene in the beginning – and one in the end – where the raccoons tangle with a bobcat. Nobody gets particularly hurt, but it might be a bit scary for a few moments for younger children. If the above are ok for your family, then “Rascal” is a very sweet film, and we will be watching it again. And, oh yes, the fellow who plays Sterling is none other than Bill Mumy – yes, that Bill Mumy, who played Will Robinson in “Lost in Space”.